Oh wow, did I love Dead Silent by Sharon Jones. I knew I would - I adored the first book in the series, Dead Jealous, and I really fell in love with the two main characters, Poppy and Michael. I'm really starting to believe that YA murder/thrillers are my absolute favourite types of books to read at the moment and that is based on the strength of books like Dead Jealous and Dead Silent. I think the thing that I loved the most about Dead Jealous was the setting of the story in a pagan festival. I loved the idea of Poppy Sinclair questioning and exploring her beliefs at the same time as investigating the death of a teenage girl. And in the same way, I thought the setting of Dead Silent on the campus of Cambridge University was amazing, especially with it snowing. I really felt like I was there alongside Poppy and Michael. 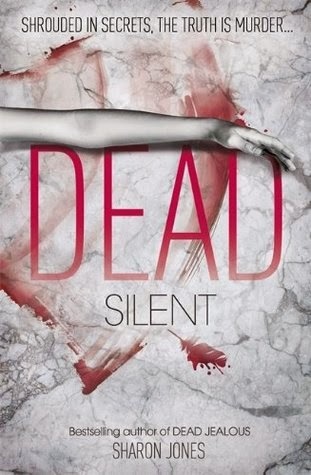 Dead Silent takes place over a few days as Michael and Poppy visit for a university interview for Michael who is applying to one of the Cambridge's colleges. Poppy tags along to visit her slightly estranged father who is the university chaplain. I had vague memories from Dead Jealous about Poppy's father and what he did for a living but I really found it fascinating to learn more in this book. Especially as a dead body appears in the chapel and blame rests squarely on Poppy's father. Because of her father and because Poppy just can't seem to help but get involved and find out things, Poppy begins her detective work. And in doing so, she finds out more about university secret societies and about angels and long-standing grudges and her father's personal and romantic history and I thought I knew who had done it and yeah. Didn't get that right at all. It was exciting to see all the twists and turns and to see how everything linked together in the end! Poppy Sinclair is by far one of my favourite characters in any book I've read recently. She's smart and stubborn and she's really not afraid to tell things straight. I love her strength and her humour. And while I absolutely ADORE her relationship with Michael, it's Poppy herself who has my heart. And I love Michael more because of how much he cares for her. Michael and Poppy are wonderful in this book. They've been going out for 4 months and things begin to get more ... physical in this book which had me laughing at loud at just how impossibly cute these two are with each other. There's obviously strong bond between her and Michael but that is not the case with Poppy and her father. It was nice to see them open up more about their relationship and how the trust between them had been damaged. I really, truly love this series to bits. I love the characters, the relationships. I love the murder solving aspects and I'm always hugely surprised by the outcomes. I especially love witnessing Poppy explore her own beliefs. And I cannot wait to see more of Poppy Sinclair! Definitely do go out and find copies of both Dead Jealous and Dead Silent if you haven't already. Great review! I just started Dead Silent last night and can't wait to read more today. This is such a good series - fingers crossed for a third book! Thanks, Kendra. I hope you continue to love it! Sounds like a great read - it's on my reading list.